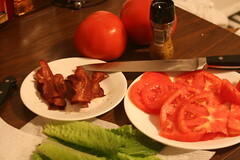 BLT - Food of the Gods! The bacon, lettuce and tomato sandwich is a perfect thing. In all its incarnations, it remains excellent. I like mine with no mayo and plenty of pepper on the tomatoes. Plenty of people slather them with different varieties of mayo or even baby greens instead of true lettuce. The photo is from this weekend's BLT event following the Eagles game. Fresh Jersey tomatoes from the Flying Feather Farm in Moorestown, turkey bacon (cholesterol is getting high), and California romaine lettuce. Plenty of McCormick Peppercorn Blend freshly ground pepper and a tiny bit of salt on toast. I had two ... with a Smuttynose Shoals Pale Ale. What a combination!!! It almost made me able to relax after the Birds muffed the game. I just picked up a six of Smuttynose Pumpkin Ale. My sister and bro in law live in Portsmouth, NH. Love that place. Yeah - they sure know what they are doing. I am finishing up a variety pack of Smuttys and then i need to move on to some Fests and Pumpkins. Let me know how the Sumtty Pumpkin is.